There are many ways to cook chicken, but this method is definitely one of our favorites: low & slow. The result is so succulent and tasty that it very well might be the best chicken you will ever make. Of course we use organic, free range chicken. Yes, this is very expensive but it is not only better for the bird but also better for you in more ways than you can imagine. To start, remove the string and any innards if present. Thoroughly wash the chicken as, like with many people, you never know where it has been or what it has been up to. Cut the lemon in to quarters. Season the cavity with salt and pepper. Stuff herbs, garlic and lemon into the cavity. Use half of the butter to cover the outside of the chicken. Season the outside of the bird lightly with salt. 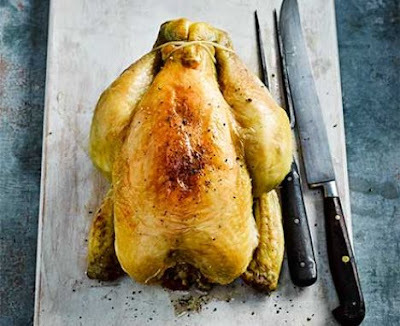 Put the chicken on a baking tray in such a way that drippings will fall down without the chicken swimming in the fat. We have this nice small backing tray that is specifically designed for the job. You can buy it here or you'll work out something. Make sure to wash your hands and any equipment that has been in contact with the raw chicken. Set your oven to 80°C. Enter the probe into the thickest part of the breast or wing. If your thermometer does not have a probe you will need to check regularly. Set desired core temperature to 75°C. Melt the rest of the butter gently in a saucepan, it should not get any color. Once the core temperature has reaches 70°C, remove the bird from the oven. Baste with the molten butter. Crank up your oven to 220°C. Apply a second seasoning of salt. This will help the skin get extra crispy. Chicken takes a lot of salt, but be careful to not overdo it - you can always add, but never take away. Put bird back in the hot oven with the thermometer. We are aiming for a core temperature of 75°C. And there it is: a perfectly crispy skin and succulent, juicy, tender meat on the inside. Note the juices on our cutting board. That is not fat but only juices. That's how yummy this meat is. Yet, the chicken is fully cooked, no red to be found. Cut the chicken into serving size pieces and serve with a nice salad, vegetables, French fries and some mayonnaise. P.S. : Do not throw away the carcass. Store it in your freezer until you have enough bones to make a nice brown chicken stock.